- 10 % discount until 31 Oct 2017. - 7=6, 14=12 for the periods 03 Jan - 31 Jan 2018 and 24 Feb - 31 Mar 2018! * The offers can not be combined! Location: Situated in the heart of Bansko - the most famous and up-to-date Bulgarian mountain resort in the Pirin Mountain, 150 km. 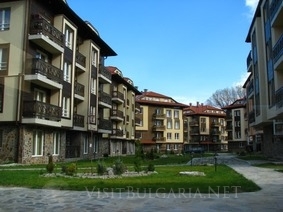 south of Sofia and very close to the National Park Pirin - is the new state-of-the-art complex ‘BOJURLAND’. Conveniently located in the downtown Bansko, just a few min walk from the famous taverns, entertainment and shopping area and 10 minutes drive from the the main lift station, substantial capital gain is expected due to its premium location ideally positioned within easy access to the ski runs. Style & Design: The houses are designed in the traditional Bansko styling with meticulous attention to detail in the design and finishing of each apartment: natural stone and wood are used extensively throughout the development. House A is unique, while Houses B1 to B7 are identical and have lifts to all four floors. Accommodation: Experience the luxurious Bojurland Aparthotel, and indulge in the comfort of our 165 apartments tastefully appointed to make yourself at home and to satisfy your desire for comfort and style. Bojurland provides uncompromising levels of service and amenities.